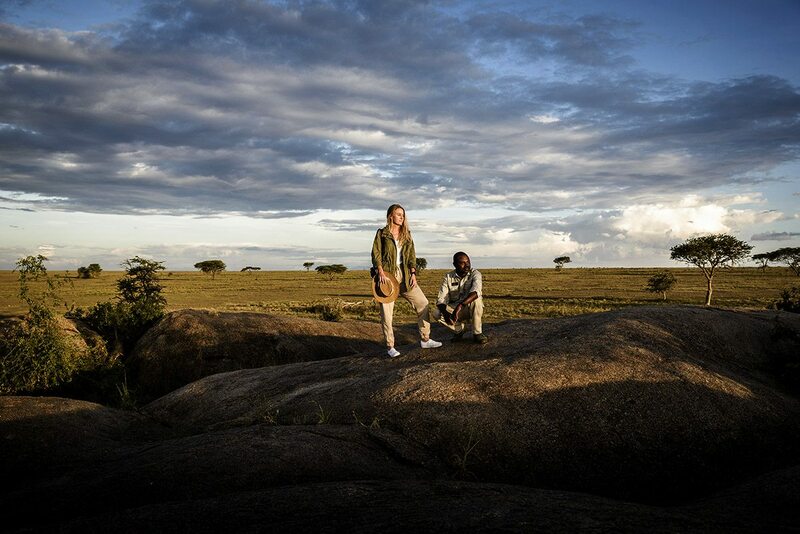 Traversing the northern, southern and western Serengeti, Sanctuary Kichakani Serengeti Camp – a luxury Tanzania safari lodge – literally follows the Great Wildebeest Migration. Depending on the season, you’ll witness the awe-inspiring spectacle of wildebeest gathering on the plains, dramatic river crossings or hours-old calves taking their first steps. 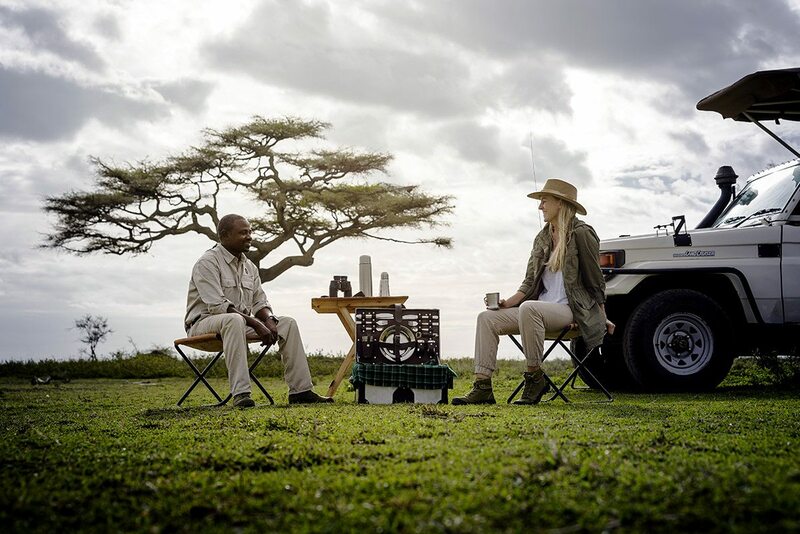 After indulging in a three-course dinner, served under a dazzling display of northern Tanzania’s stars, we join the other guests sharing stories around the campfire. The guides soon join us, and we ‘ooh’ and ‘aah’ amid tales of dramatic sightings, dissolving into laughter as we hear of comically close encounters.Our senses feel somehow more alive, the crackling of the fire and screech of a bushbaby somehow louder in the immensity that surrounds us under the thin veil of darkness. Although we can’t see the flat, acacia-topped plains of the Serengeti and the multitude of life they support, we can imagine the herds of wildebeest gathering in their thousands, stamping their feet and dozing fitfully through the night.Meandering back to our room at Sanctuary Kichakani Serengeti Camp, we pass one of the many comfortable sofas placed around the camp to soak up the Serengeti views. We sit for a while, gazing into a darkness lit up by the occasional flash of lightning. 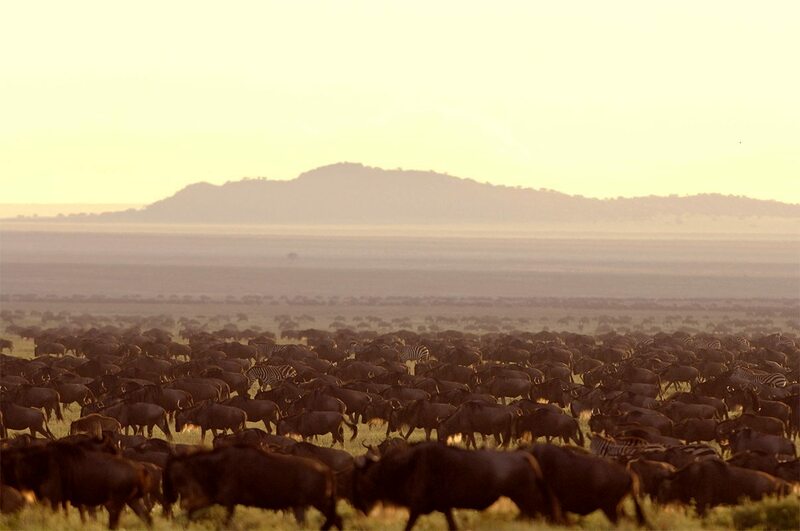 Soon, we’ll be tracking the Great Wildebeest Migration, the greatest show on earth. 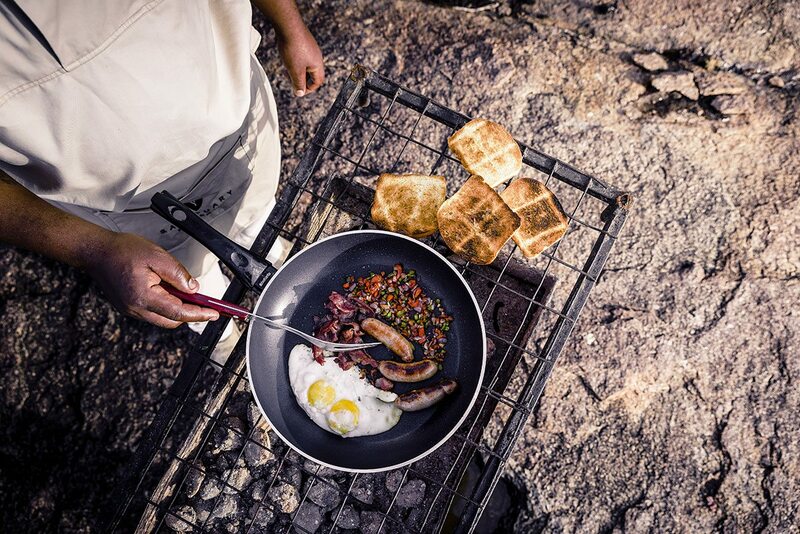 After indulging in a three-course dinner, served under a dazzling display of northern Tanzania’s stars, we join the other guests sharing stories around the campfire. The guides soon join us, and we ‘ooh’ and ‘aah’ amid tales of dramatic sightings, dissolving into laughter as we hear of comically close encounters. Our senses feel somehow more alive, the crackling of the fire and screech of a bushbaby somehow louder in the immensity that surrounds us under the thin veil of darkness. 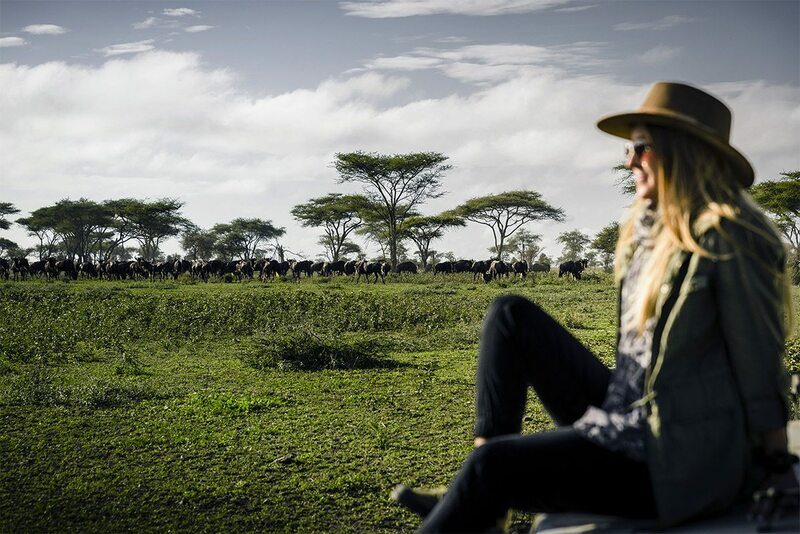 Although we can’t see the flat, acacia-topped plains of the Serengeti and the multitude of life they support, we can imagine the herds of wildebeest gathering in their thousands, stamping their feet and dozing fitfully through the night. Meandering back to our room at Sanctuary Kichakani Serengeti Camp, we pass one of the many comfortable sofas placed around the camp to soak up the Serengeti views. We sit for a while, gazing into a darkness lit up by the occasional flash of lightning. 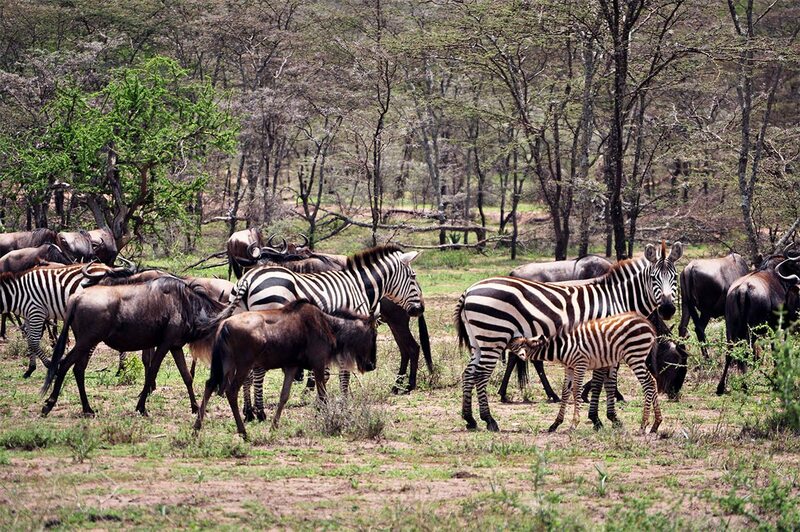 Soon, we’ll be tracking the Great Wildebeest Migration, the greatest show on earth. 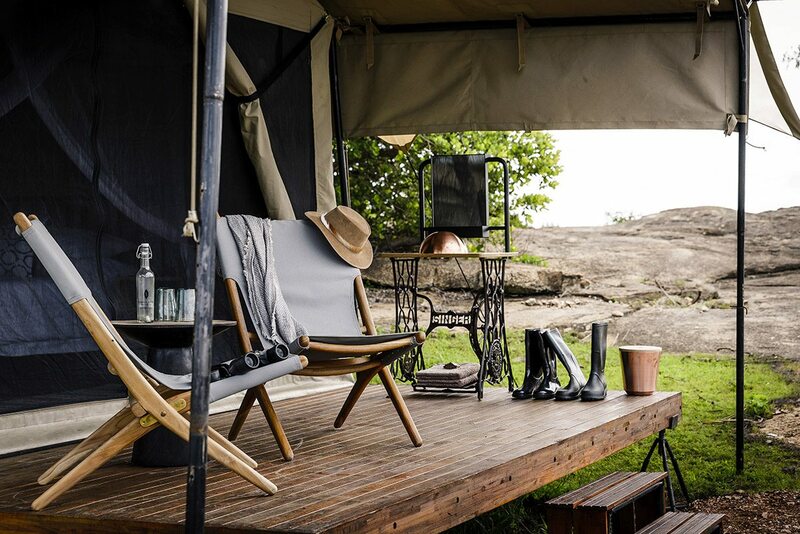 It’s a pleasant surprise every time we walk into our spacious tent, which is more like a suite, with its plush king-sized bed and billowing mosquito nets. 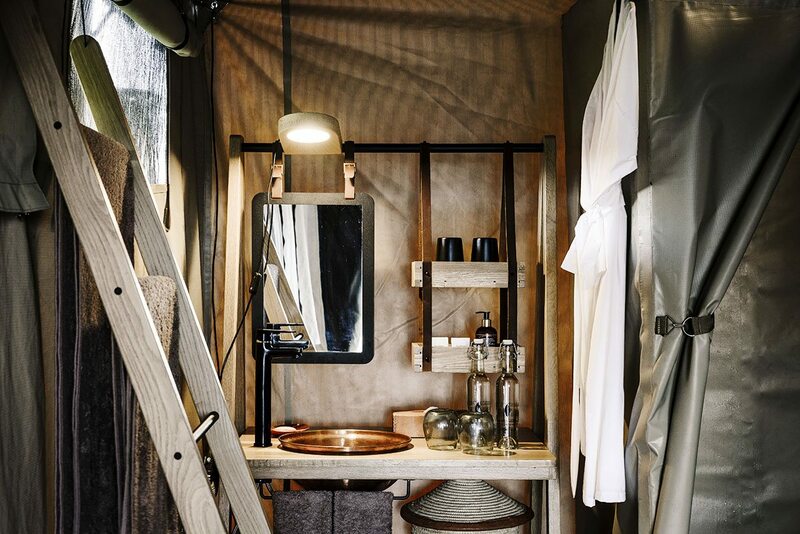 It’s the essence of safari chic: canvas walls, a soaring roof draped in fabric, paraffin lamps and even a hanging closet.The en-suite bathroom is more than big enough for the two of us, and our personal attendant is quick to deliver hot water for our shower. While I brush my teeth I can hear my partner humming, clearly enjoying the bucket-shower experience!With a hairdryer and cotton gown waiting for us, it’s hard to believe we’re out in the wild, in the heart of nature at its most raw. Although the cackle, growl and grunt of hyena, lion and wildebeest should keep me awake, I feel so warm and safe here that instead it lulls me into a deep and peaceful sleep. 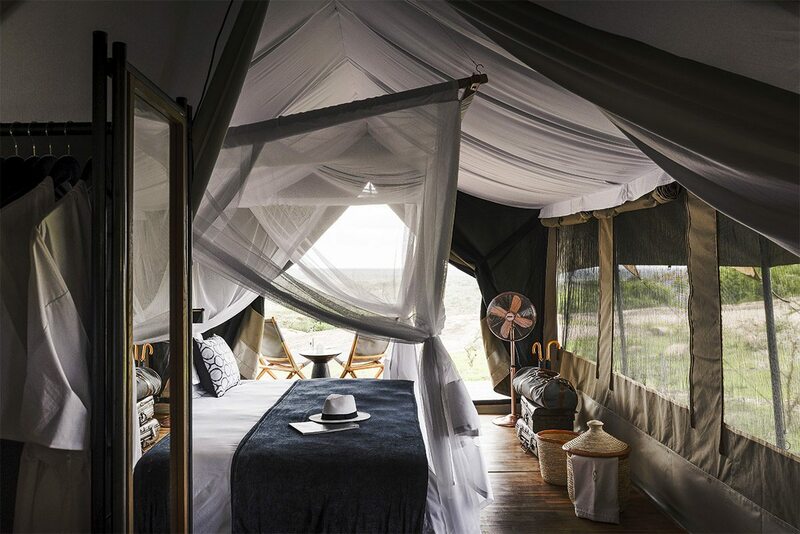 It’s a pleasant surprise every time we walk into our spacious tent, which is more like a suite, with its plush king-sized bed and billowing mosquito nets. 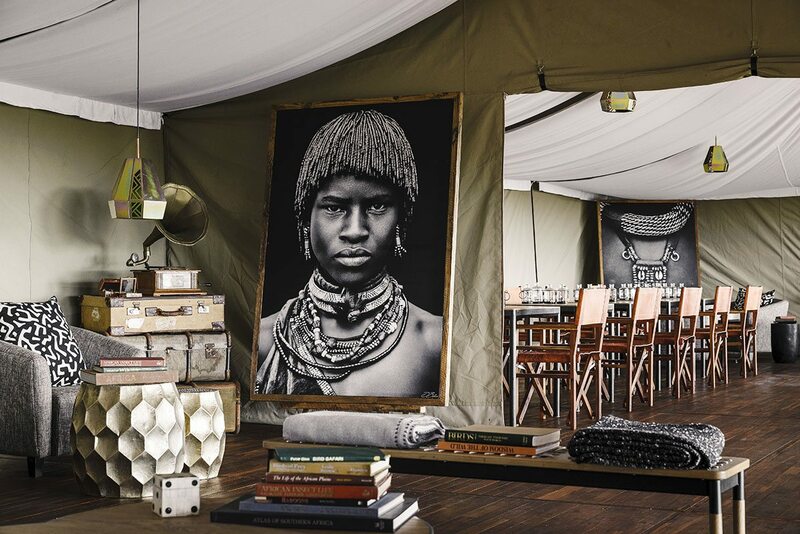 It’s the essence of safari chic: canvas walls, a soaring roof draped in fabric, paraffin lamps and even a hanging closet. The en-suite bathroom is more than big enough for the two of us, and our personal attendant is quick to deliver hot water for our shower. While I brush my teeth I can hear my partner humming, clearly enjoying the bucket-shower experience! With a hairdryer and cotton gown waiting for us, it’s hard to believe we’re out in the wild, in the heart of nature at its most raw. Although the cackle, growl and grunt of hyena, lion and wildebeest should keep me awake, I feel so warm and safe here that instead it lulls me into a deep and peaceful sleep. 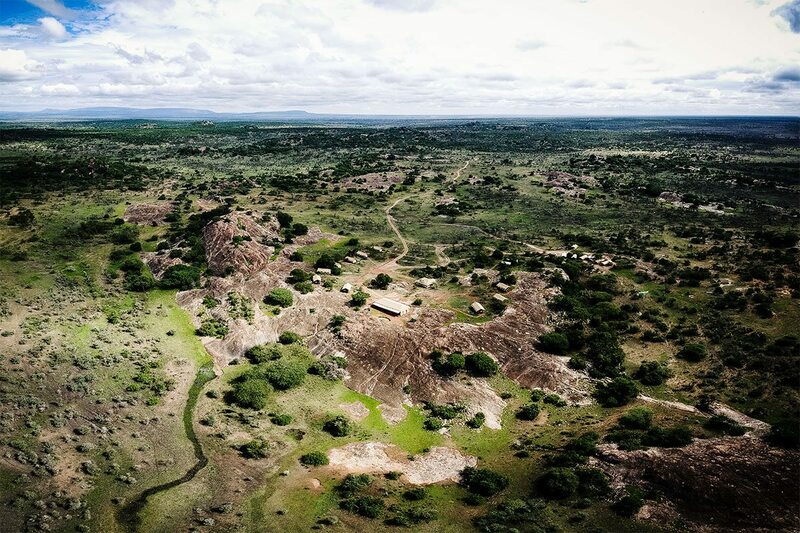 Designed to have minimal impact on the surroundings,Sanctuary Kichakani Serengeti Camp moves with migration, meaning it has three different locations throughout the year to ensure the best possible sightings. 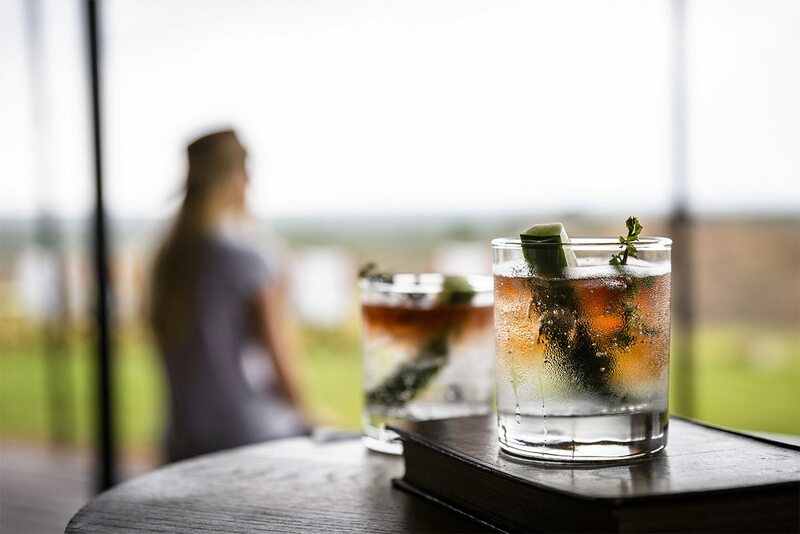 We fell in love with its relaxed safari feel; roaring fires that allowed us to socialise into the night and endless views into the Serengeti.We’d timed our visit so we could view the wildebeest crossing the Grumeti River, but nothing could have prepared us for the experience. We heard them before we saw them, the air abuzz with bleating and grunting that reached a crescendo as we neared the herd. The beasts covered the plains near the river in a shifting mass that filled every inch of the dusty landscape.With the option of morning, afternoon and full-day game drives, we were able to really feel like we were part of this amazing spectacle – and indeed we got to witness the drama of a river crossing. Thanks to the wonderful stories of our exceptional guide and the fantastic service from staff (especially our personal attendant), we will be back, this time for the wildebeest calvings. 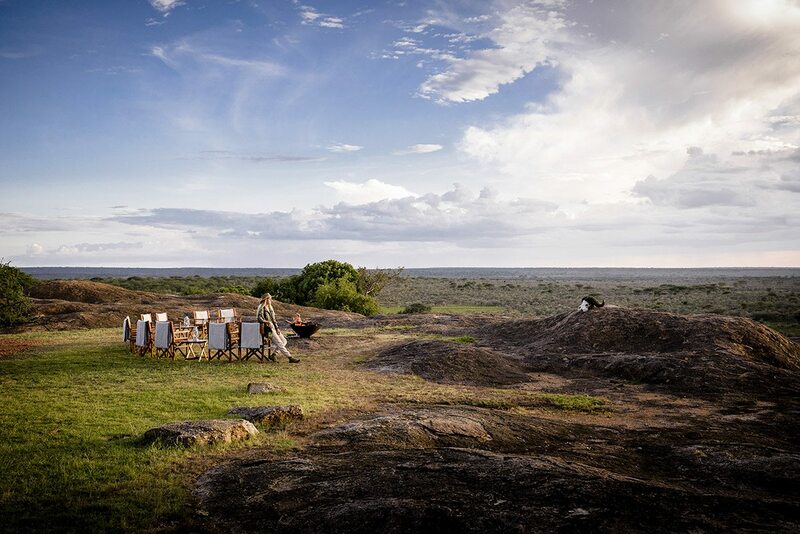 Designed to have minimal impact on the surroundings,Sanctuary Kichakani Serengeti Camp moves with migration, meaning it has three different locations throughout the year to ensure the best possible sightings. 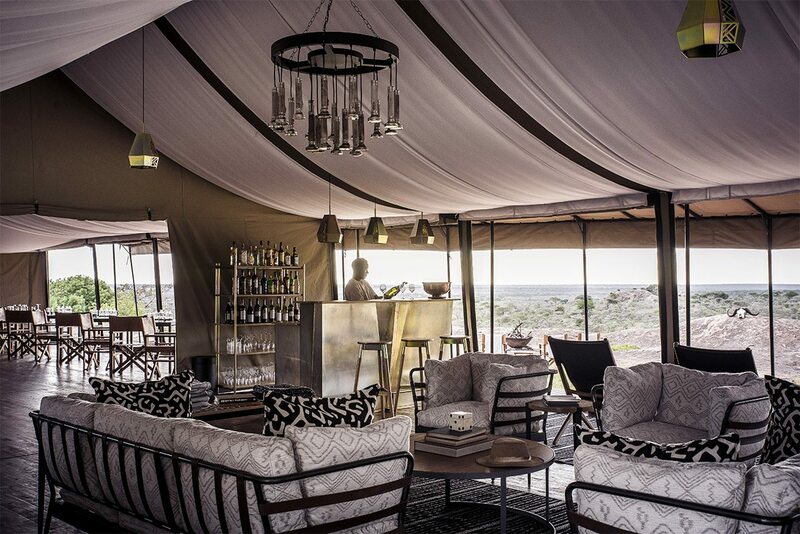 We fell in love with its relaxed safari feel; roaring fires that allowed us to socialise into the night and endless views into the Serengeti. We’d timed our visit so we could view the wildebeest crossing the Grumeti River, but nothing could have prepared us for the experience. We heard them before we saw them, the air abuzz with bleating and grunting that reached a crescendo as we neared the herd. The beasts covered the plains near the river in a shifting mass that filled every inch of the dusty landscape. With the option of morning, afternoon and full-day game drives, we were able to really feel like we were part of this amazing spectacle – and indeed we got to witness the drama of a river crossing. Thanks to the wonderful stories of our exceptional guide and the fantastic service from staff (especially our personal attendant), we will be back, this time for the wildebeest calvings. 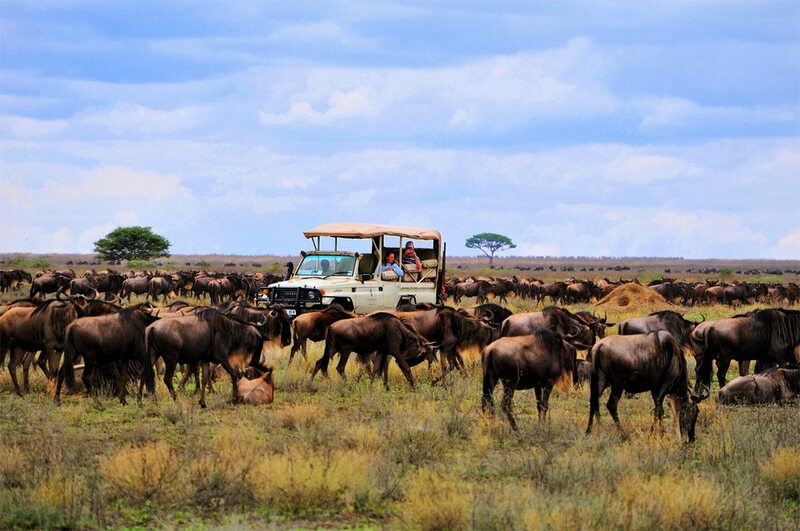 A mobile safari camp with 10 classic safari tents that follows the Great Wildebeest Migration in the Serengeti. Front row seat to the migration with the chance to witness the crossing of the Grumeti River, personal attendant and private dining available. 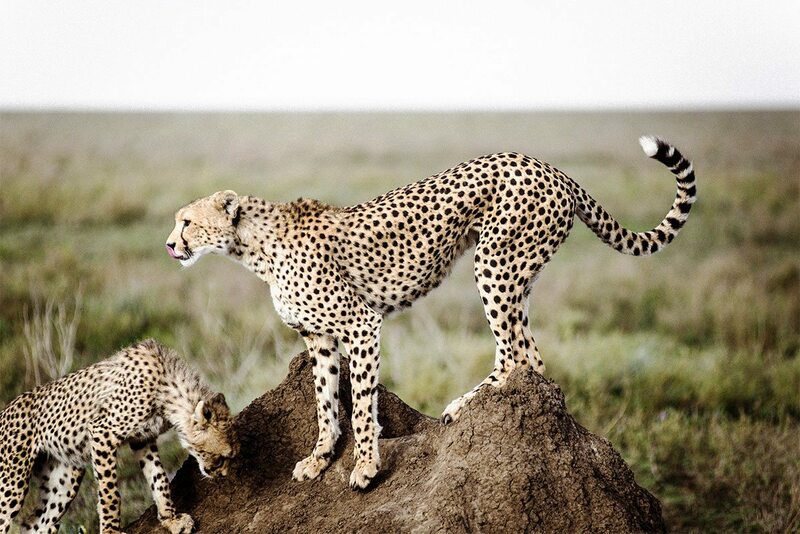 Game drives, birdwatching and bush sundowners. Children aged six and above are welcome, with three suites available as triples. Children of all ages are permitted if the camp is booked exclusively. Certain activities are age-restricted.